MAYFAIR — Since February, when Ian Schwartz learned he would be dancing during Ireland's President Michael D. Higgins May visit to Chicago, the teen practiced two hours a day, three times a week. The hours of practice paid off Sunday as Schwartz, 16, made his mom swell with pride witnessing what she called the best Mother's Day gift and the biggest performance of his dancing career. "There's nothing like that," his mother, Jill Schwartz, said after the performance at the Irish American Heritage Center, 4626 N. Knox Ave. "This could be the top achievement as an Irish Dancer, where do you go after that? He definitely beat out his brothers. They didn't dance for the president in front of me." Ian's inspired performance earned him a standing ovation from the crowd and a handshake from Higgins, who smiled and tapped his foot during the 16-year-old's performance. "It was kind of cool, kind of different and kind of awesome. It was like shaking Barack Obama's hand... just wow," Ian said. Speaking in a heavy brogue, Higgins called the Irish American Heritage Center one of the most significant Irish Cultural organizations in the United States. 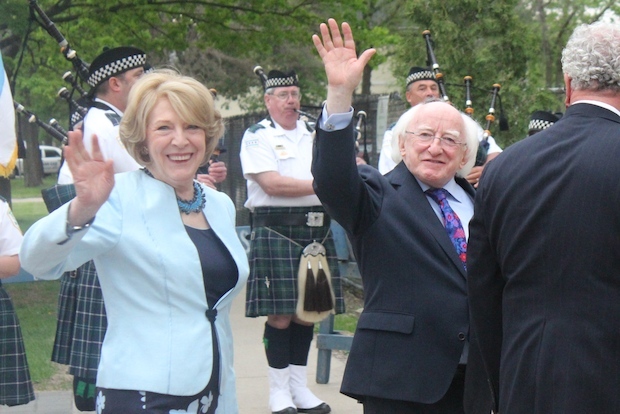 The third Irish president to visit the center, he was greeted by a throng of Irish dancers and bagpipers. "The Center is connected to the story of the evolution of the different streams, for there is not one stream but many streams of Irish migration to Chicago across many decades," Higgins said. "It's a blessing to stand in a center like this and see its many different rooms and to recognize and experience the power of culture to transcend both time and space," said Higgins. "Although, we're 6,000 kilometers from Irish shores... Irish culture has continued to grow and flourish here in Chicago." John Gorski, President of the Irish American Heritage Center, called Higgins' presence an "honor and tribute to all the volunteers who built [the center] from a dilapitated public school building." "There's a lot of places in the Midwest he could have visited, but he understands the effort that went into this," said Gorski. "This is a grassroots community effort and he's a man of the people. He understands this is an organization built from the ground up. An organization that has an investment in the community." Hosting Higgins helped make a statement to future members: the organization is on a mission to give people "a place to rely on to reconnect with their culture," Gorski said. Higgins gave the center a Celtic cross as a memento of his visit. As his wife Sabina Higgins left, an 11-year-old girl sprinted through security offering her own gift to "the first lady of Ireland." "This is for you. Welcome to Chicago. I hope you have a great time," Gwendoline Byrne said offering a rose, a gift Sabina Higgins responded to by giving the girl a kiss on the cheek. "All of our family is from Ireland so it was really special," Byrne said.